It probably goes without saying, but drinking plenty of water is a big deal on a hot day. It will keep you from feeling faint or headachy, help you concentrate and be present in the moment as you say ‘I Do’, and it’s a must before cracking open the bubbly later on. Pop some half-filled bottles of water into the freezer the night before, then on the day, fill them up with water and take with you. You’ve got yourself a chilly drink and a cool-pack for the back of your neck, all in one. Prepare them for each member of the bridal party. Or better still – put one of them in charge, so that’s one less thing on your list. 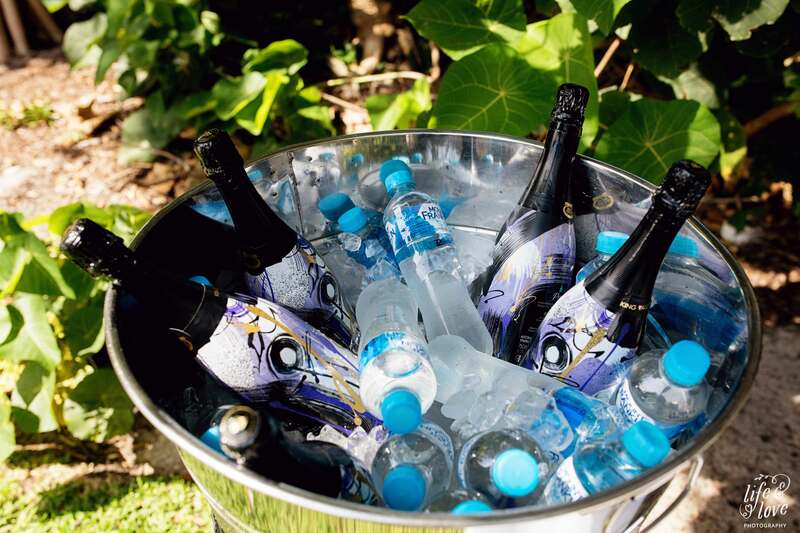 And “Don’t forget to have plenty of water on hand for your post-ceremony photo shoot, to keep you fresh, fabulous and photo-ready”, advises wedding photographer extraordinaire, Lee Burgess of Life and Love Photography. Add to that some umbrellas for the bridal party, and you’re good to go. The same goes for having a bite to eat. It’s so easy to get caught up in all the beautifying, zhooshing and photographing that you totally forget to eat before the wedding. Big mistake! No-one wants to be ‘hangry’ on their wedding day, so do yourself a favour… feed your body so you can still be merry later on. 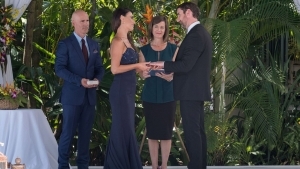 If you’re getting married in the hotter months, plan your ceremony for late afternoon. The heat can be pretty brutal at 3pm! Lee Burgess of Life and Love Photography suggests around 2.5 hours before sunset as the perfect time to tie the knot. Choose a shady spot for the ceremony, and arrange the aisle and seating so that no-one is facing directly towards the sun. That goes for the wedding party and the guests. Don’t be ‘fashionably late’ on a hot day, as your guests will be languishing in the heat waiting for you. Not cool. White umbrellas for the wedding party and VIP guests are equally fab in the hot sun, and in a summer shower of rain. You can hire or buy them quite cost-effectively. Here’s a seriously useful tip. Ask for the guests’ chairs to be set up a few extra inches apart, rather than right up against each other. Give your people some personal space. There’s nothing more uncomfortable than being jammed shoulder-to-shoulder and thigh-to-thigh on a hot day. 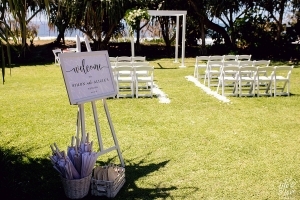 Not only will this make a big difference to your guests’ enjoyment of your ceremony, it gives them more latitude (literally) to pop up an umbrella if they need to. Have cold water and little fans available for your guests. The fans make a lovely, practical wedding favour. Mozzie repellent is also a great thing (in some locations, an essential thing) to have on hand. Did I mention, don’t be fashionably late? Especially awesome if you are decked out in a suit, or a heavy dress with lots of fabric or gorgeous beading. 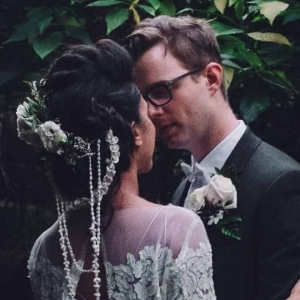 Just before the ceremony, grab your towel and dab your forehead, upper lip (taking great care not to spoil all that zhooshing), your neck, arms and hands – and don’t forget that ring finger! Guys – wear a singlet! An extra layer on a hot day might sound counter-intuitive, but it works. Rather than your shirt clinging uncomfortably and showing nasty sweat marks, a singlet will soak it up and help cool you off. So grab yourself a Chesty Bonds, fellas! Don’t forget the sunscreen. 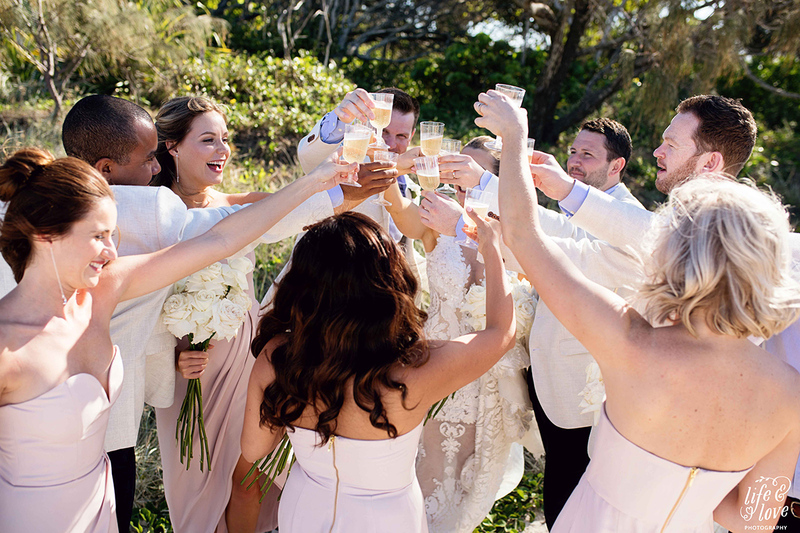 Even if your ceremony is going to be in the shade, you’ll probably be in and out of the sun for photos and mingling with guests throughout the day. You don’t want to rock up to your reception (or heaven forbid, your honeymoon) with a dose of sunburn. While you wait for the ceremony to begin, stay cool by hanging your jackets over the back of a chair until the last minute. Chill out in a shady spot (or air-conditioning) if you can. I’ve even had to step inside a catering cooler van to bring my core temp down between ceremonies while filming Nine’s ‘The Last Resort’ at Mission Beach. That was some intense heat! If you do start to feel a bit faint or whoozy during your ceremony, wriggle your toes and squeeze your calf muscles a few times. No-one will know you’re doing it, and it can be enough to get the blood moving and stave off a fainting episode. If you’re using a phone or tablet to play music for your ceremony, make sure it’s not sitting in full sun as most devices are programmed to shut down when they overheat. And regardless of the weather, have a back up plan, with your playlist ready to go on another device. If you have long locks, hair and beauty expert Sarah Thong recommends an up-do that will go the distance, as heat and humidity can make long tresses frizzy or flat, messy and clingy. Using a hair ‘donut’ may help to offload the weight of hairpins, and add support and anchorage for your up-style. Sarah also recommends using a light-hold hairspray during styling to add a beautiful, weightless volume and hold, and finishing off with strong-hold hairspray then a spritz of light shine spray. Use face and eye primers as a base. Sarah’s favourites are Hourglass Mineral Veil Face Primer, and NARS Smudge Proof Eyeshadow Base. For oily skin – lightly dust some translucent powder on top of the primer, and then apply foundation. Use a hydrating eye cream before applying concealer to prevent creasing. Set the oily areas such as the T-zone with loose powder. Finish with a makeup-setting spray. Sarah’s top pick is Urban Decay All Nighter. Keep your powder and lippie with you for touch ups at photo time. 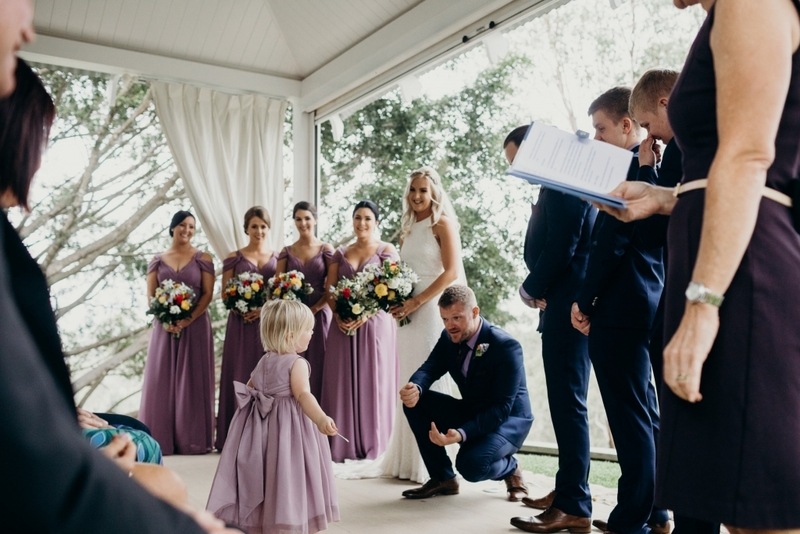 If you’re having flower girls and page boys in your wedding party, your best chance of achieving that ‘cuteness overload’ factor you’re no doubt going for, is to really consider what’s going to work for them. Be realistic in your expectations of what they need to do (psst. I can help with that); in your choice of outfits for them; and be ready to go with the flow if they back out in the heat of the moment… (no pun intended). I hope you’ve found some gems among these ideas to help you be fabulous on your wedding day. Stay cool!